Watching College and NFL Football at home is ok, but, then you have to clean up after everyone☹ Break away from your comfort zone and meet family and friends at The Distillery, Your Football Headquarters®! We work hard to make sure that all the bases are covered: We show all the games in High Definition comfort on one of our 30+ TVs! When it comes to Sports, The Distillery knows how to deliver the very best experience - Awesome Food, Great Beer Specials and there’s not a bad seat in the house! Our Wings are the best in town, plump, crispy, cooked just right and perfectly sauced with one of our 12-signature flavors! The Distillery is known for more than just our laid back, comfortable atmosphere. We’re also one of the best places to enjoy a drink or two while you indulge in our distinctive menu of mouthwatering appetizers & small plates, entrees and Seasonal Features, including our award-winning wings, burgers, sandwiches, fresh salads, seafood, ribs, pasta and much more to make your football experience memorable! 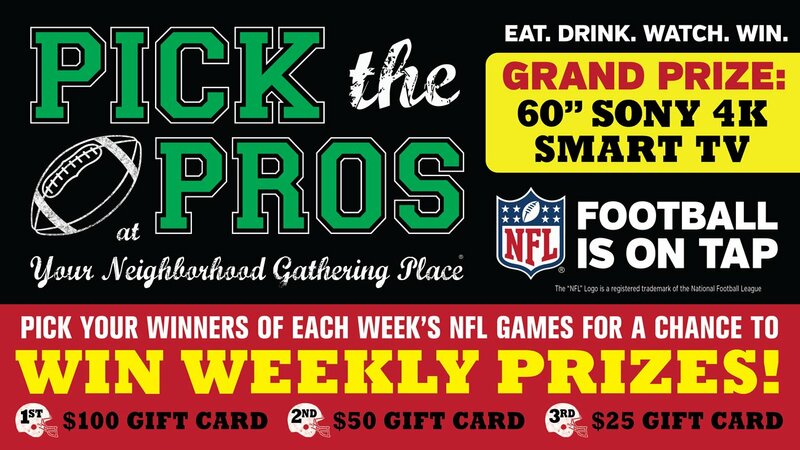 Play our Pick The Pros for you a chance to win some great prizes while cheering on your favorite team! No purchase necessary to enter or win, and playing couldn’t be easier. Get a contest form provided and then check the name of the team you think will win. Each correct pick is worth one point and winners will be tallied based on the most points for that week. Weekly winners are eligible for a $100 gift card and automatically entered to win a Sony 60” 4K HDR Ultra HD TV. Complete details are available on the official contest rules page. Each Distillery location is equipped with 30+ high-definition TV monitors, as well as a complete NFL viewing package to make sure you never miss a moment of your team’s action. Many of our tables are outfitted with personal televisions and during halftime, we announce the previous week’s winners! You can play darts or get caught up with friends. If you’ve never visited The Distillery, this is a great time to get to know us. Stop in to any of our 5 locations in Rochester and Syracuse and you’ll see why fans who truly love the game watch it at The Distillery!